Did you know ACCU was founded in 1899 by 53 delegates from Catholic colleges throughout the United States? The ASSOCIATION OF CATHOLIC COLLEGES AND UNIVERSITIES, founded in 1899, serves as the collective voice of U.S. Catholic higher education. 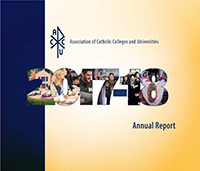 Through programs and services, the association strengthens and promotes the Catholic identity and mission of its member institutions so that all associated with Catholic higher education can contribute to the greater good of the world and the Church. Through research, publications, conferences, consultations, special programs, and standing relationships with other agencies, ACCU encourages and facilitates sharing of ideas and cooperative efforts among its member institutions. ACCU’s Journal of Catholic Higher Education is published semi-annually, and its electronic newsletter, Update, quarterly. Contact with the Catholic hierarchy is maintained principally through the United States Conference of Catholic Bishops and the Congregation for Catholic Education of the Holy See. The association also actively works with other Catholic organizations, such as the National Catholic Educational Association, the National Catholic College Admission Association, the Association for Student Affairs at Catholic Colleges and Universities, the Catholic Higher Education Research Cooperative, the Catholic Health Association, Catholic Charities USA, and the National Leadership Roundtable on Church Management. 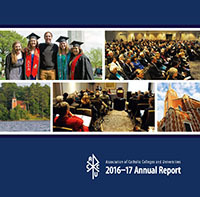 The association maintains national, international, and ecumenical relations with other higher education institutions through membership in the Washington Higher Education Secretariat, the Association of Executives in Church-related Higher Education, the National Association of Independent Colleges and Universities, and the International Federation of Catholic Universities. ACCU also maintains ongoing relations with the Catholic and secular media and with organizations conducting research concerning Catholic higher education. Read more about the ACCU awards. As a benefit of membership, ACCU provides our mailing list in electronic form at the request of presidents of member institutions. Read the full policy.